*I do not claim to be a nutritionist nor do I advocate a one size fits all approach. Information is general in nature and does not suggest or enforce radical change to veterinary diets. All dietary information supplied is used personally by myself when feeding my own pets. I would never suggest dietary information that I myself would not adhere to. Information used is done so at owner’s risk. My dog “Mossy” has a healthier diet and fitness regime than I do! Mossy starts the day with a free range egg or two (mostly raw). Later she will get a frozen drumstick or a raw beef/lamb marrow bone. She also gets some of our leftover cooked vegetables such as peas, carrots and broccoli. Occasionally she gets some honey or icecream, but very small amounts. I usually walk her to my local dog friendly cafe in the morning and she gets to lick my empty coffee cup! My dog “Mossy” has a healthier diet and fitness regime than I do! Mossy starts the day with a free range egg or two (mostly raw). Later she will get a frozen drumstick or a raw beef/lamb marrow bone. She also gets some of our leftover cooked vegetables such as peas, carrots and broccoli. Occasionally she gets some honey or ice cream, but very small amounts. I usually walk her to my local dog friendly cafe in the morning and she gets to lick my empty coffee cup! My cats do not have fitness regimes for obvious reasons! They lay around all day becoming lively at night. Two of my cats are kept inside 90% of the time. Occasionally they will go outside during the day, but not to hunt - they just look around and come back inside. They generally love tuna in springwater! By far their favourite food. Chicken, turkey and whiting/herring are all up there. One of my cats loves yoghurt in small amounts. Mossy’s weight is strictly kept to 16kg. She is a small Border Collie, but I assure you this is an acceptable weight and is not unusual. She has very small amounts of fat on her stomache, thats it. Her ribs, spine and waist are very easy to detect by feel, but cannot be visibly seen. She is in perfect body condition and this keeps the weight off her joints, especially the elbows, hips and spine. She has very high energy levels and is a very happy and relaxed dog. Keeping cats lean is arguably more important than doing so for dogs. Cats are superb athletes and rely on light bodies to jump and move efficiently. Their joints are not designed to carry excess weight at all. An obese cat is also at higher risk to develop diabetes which is life threatening. I know that by keeping her in top shape it will ensure a long, happy and healthy life. There are no guarantees with health, but because we are so close I want to give her every chance at a long life. Her teeth are pearly white and strong because of all the raw marrow bones she chews. Note - never give your dog cooked bones under any circumstances! The cooking removes the elasticity of the bone causing it to shatter into long, hard and sharp shards which can pierce your dogs throat, stomach or intestines. This is incredibly painful to your dog and life threatening. Surgery to remove damaged intestine due to bone fragments is expensive and distressing to dog, owner and vet! 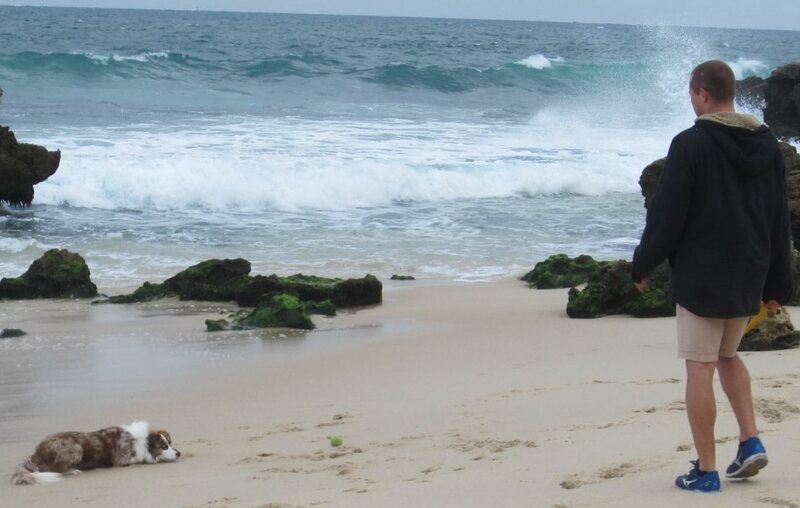 Mossy goes to the dog beach everyday for a swim. The saltwater seems to keep her coat shiny and clean. She also keeps fit through swimming and chasing the ball into the waves. Later in the day around 5 - 6 pm she will go to the dog park for socialization and if she is well behaved I will throw her a ball! Good nutrition is essential to your pets health! Not all food is created equal, for example we know that lean red meat such as beef contains more iron weight for weight than white meat, ie chicken. We know that processed food contains in general, more salt, fat, additives and preservatives than natural food. Yet, we humans are brilliant at ignoring health warnings. We let our bodies carry more weight than nature intended, we ingest more sugar than we can handle and do not eat enough fibre. We become deficient in vitamins and minerals putting added stress on our immune system. Interestingly, we do the same to our pets! Obesity in cats and dogs is a serious problem and accounts for a range of health issues. Diabetes, many cancers, skin issues, joint disease and premature ageing/death are all products of obesity and poor diet.